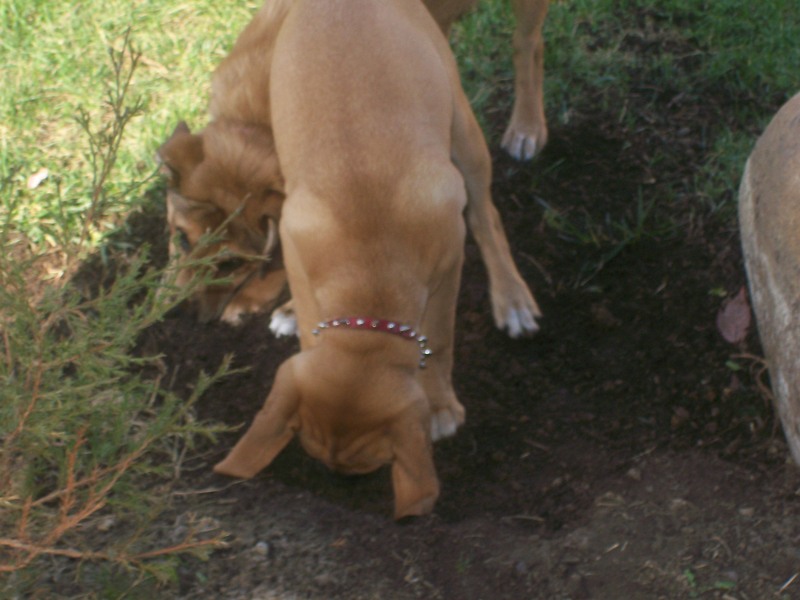 I got to play with my roommate/BFF Mocha, and we dug an awesome hole in the backyard. I think Mommy wanted to be mad, but she couldn’t be because we were just too darn cute digging it! In other BIG NEWS, I got my very first piece of mail EVER today! 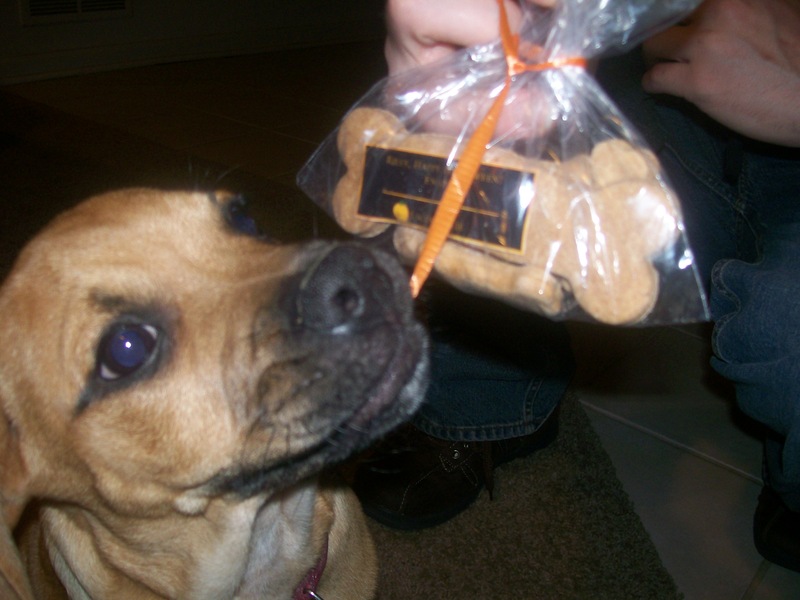 It was even addressed to me, Riley the Puggle! I was so excited. My friend Kylie sent me a special Halloween present. 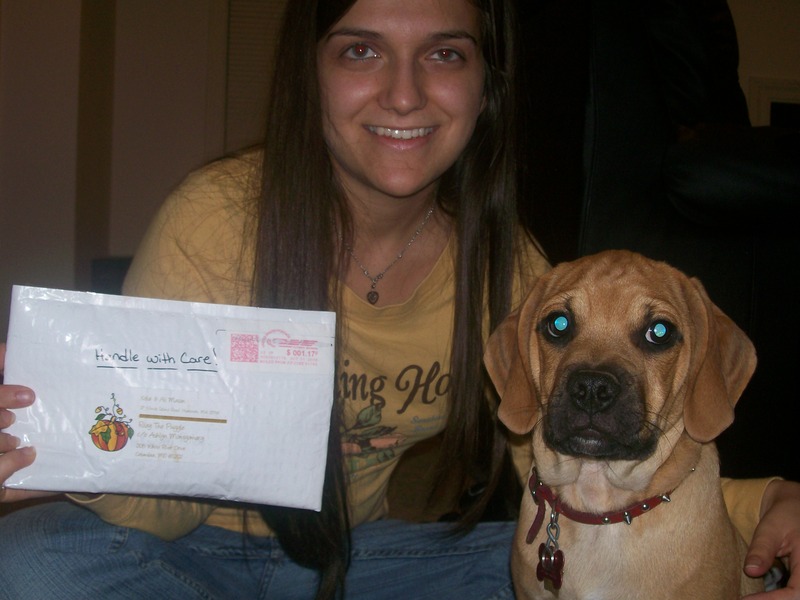 Me, Mommy, and my MAIL! … and guess what was inside the package? TREATS! I was very, very excited. I even tried to open the package while Mommy was taking a picture! It was so hard to wait! Licks & Kisses to all of you out there reading my blog! Wow Riley that’s so cool, you got your very own mail! And what a cool piece of mail that was! Did your mommy make you take a bath after all that digging? I always have to take baths after I play in the yard…my mommy’s nuts! BOL! I’m Sooooo glad they got there ok!! I begged Mom to try to pack them up real safe! Hope it made your Halloween! Getting to dig in the yard and getting mail!!! How cool is that? Riley! Are you trying to dig to China? I am too but I only try to dig into a pillow! Can I come help you dig? Hi Riley, You look so cute digging that hole. Love watching your paws working hard! way too cute! Aren’t those cookies from Kylie the best? Kylie and her mom are awesome! Hi Riley! Welcome to Dogs With Blogs! Look at who is a good digger? Riley! We are loving your blog and will be reading it frequently! Come check out our page, we have tons of blog dog friends who comment on our page and they’d love to have you as a friend, we can write in an entry about your blog if you are ok with that, so that you can make new friends!??! Let us know!!!! I don’t think we’ve met! I’m a fellow Blogging Puggle too! You should come by to check me out. I would love to be friends!